A man died Saturday afternoon from injuries suffered during a shark attack off Cape Cod, authorities said, the first fatal shark attack in Massachusetts in eight decades. Bystanders pulled a 26-year-old bite victim onto Newcomb Hollow Beach and performed CPR, Wellfleet Police Lt. Michael Hurley said in a statement. The man, who had been boogie-boarding with another person, according to the Associated Press, was sent to Cape Cod Hospital, where he later died, Hurley said. The Boston Globe identified the victim as Arthur Medici, from Revere, Massachusetts, a city just northeast of Boston and about a two-hour drive from Wellfleet. The National Park Service, which is responsible for that part of the Cape Cod National Seashore, tweeted that the attack took place about 300 yards south of the beach. It happened about 30 feet from shore, according to the Cape Cod Times. Access to the beach facing the sea was closed. Hurley said the Cape Cod District Attorney will handle an investigation into the incident. The seal population in the area has grown, and with them come sharks in aggressive pursuit, said Gavin Naylor, the director of the Florida Program for Shark Research. There have been recent reports of 10- to 12-foot white sharks in the region, he said. Many attacks occur when sharks mistake humans for prey in hit-and-run attacks, he told The Washington Post on Saturday. Researchers have suspected attacks may increase as sharks may have more chances to encounter people, especially as surfers chase waves brought on by hurricanes, he said. While he did not have details about Saturday's attack, Naylor said it was likely a white shark that attacked the man in a case of "mistaken identity" in the more shallow waters where boogie boarders seek waves. "A 12 foot-long, 1,200-pound white shark moving at 20 knots with an open mouth does a a bit of damage," he said. "They're like a truck when they get bigger." It has been 82 years since a shark attack claimed a life in Massachusetts. Joseph Troy Jr., a 16-year-old, was killed by a white shark in Mattapoisett on Buzzards Bay in 1936. Joe Booth, a local fisherman and surfer, watched the Saturday attack from shore, he told the AP. Medici kicked aggressively, Booth said, telling the Boston Herald that "the thrashing was unprecedented." There was a glimpse of a tail that pierced the water's surface. Then the other boogie boarder, possibly Medici's brother, dragged the injured man to the sand. "I was that guy on the beach screaming, "Shark, shark!" Booth told the AP. "It was like right out of that movie 'Jaws.' This has turned into Amity Island real quick out here." A California man quoted but not named by the Globe said he noticed the commotion as one man was pulling another to shore. Medici had been bitten on his right thigh, was bleeding heavily and was unconscious. Witnesses told the Cape Cod Times that bystanders tried to make tourniquets with a towel, dog leash and boogie-board cord. "I saw that he was bleeding and reached around the back of his leg, and there was nothing there," the California man told the Globe. "And there were bone-deep lacerations down by his calf." A retired physician estimated in The Cape Cod Times that emergency responders took at least 20 minutes to arrive; he and others suggested Medici died at the beach, possibly from loss of blood. 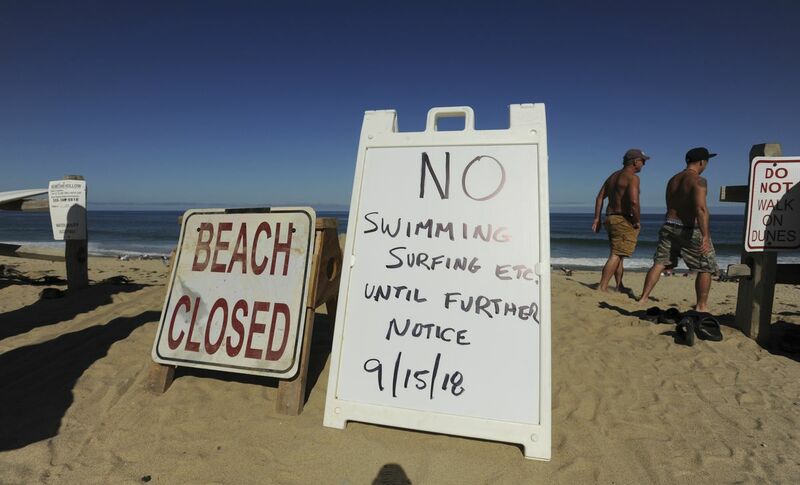 Cape Cod National Seashore warned beachgoers on its website that no lifeguards are on duty at its beaches during offseason months, and advises them to watch for white sharks. The man's death Saturday comes exactly a month after an Aug. 15 shark attack off Cape Cod. A shark's powerful jaws clamped down William Lytton's leg a few yards from the shoreline at Truro Beach, about 10 miles north of where Saturday's attack occurred. Lytton freed himself by punching the shark in the gills, he told the Globe. He endured a half dozen surgeries and hopes to leave the hospital by the end of September, he told the paper. Shark attacks have increased worldwide each decade due to booming populations adding more bathers in the water, the International Shark Attack Files said, but nothing indicates a rise in the per capita rate. Attacks occur in nearshore waters, often near sandbars where potential meals congregate. Last month, beachgoers at Cape Cod watched a white shark tear a seal apart just feet away from the beach.